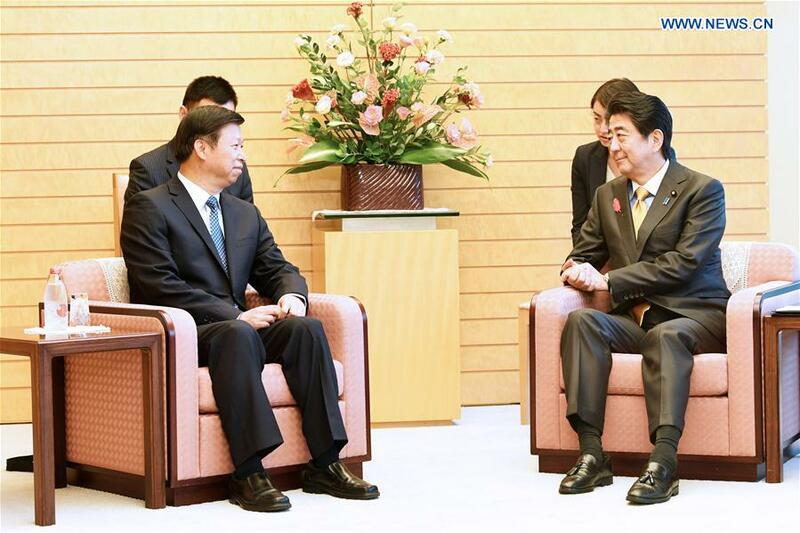 TOKYO, Oct. 11 (Xinhua) -- Japanese Prime Minister and President of the ruling Liberal Democratic Party (LDP) Shinzo Abe met with Song Tao, head of the International Department of the Central Committee of the Communist Party of China (CPC) here on Thursday. Song said that the leaders of the two countries have confirmed the principles and direction of the development of bilateral relations during their recent meeting. He said that the eighth meeting of the China-Japan ruling parties exchange mechanism held here was aimed at implementing the consensus reached between the leaders of the two countries, further bringing into play the political leading role of the party-to-party exchange mechanism in bilateral relations, safeguarding the political foundation of bilateral ties, managing and controlling differences in a constructive way and jointly promoting practical cooperation under the Belt and Road Initiative. Abe, for his part, said that the exchanges between the ruling parties of the two countries are important to the development of bilateral relations, and Japan is willing to make joint efforts with the Chinese side to enhance party-to-party exchanges, boost political mutual trust and promote continued improvement and development of bilateral relations.